2 Bedroom 1 Queen sized bed in the Master & 1 Twin bed in guest bedroom. Fully Furnished 2 bedroom Cottage Includes Heat and basic cable TV. Vacation any time of the year! Great for all seasons: Summer, foliage, Winter and Spring! Intimate Sweet Cottage rental. 2 Bedroom fully furnished. Basic Cable TV, Microwave, 1 Queen sized bed in the Master bedroom and 1 smaller bed (twin size 1 person) in the guest bedroom. 3/4 Bathroom. Linens and bath towels are not included. Picnic table overlooking the Lake. A quick 15 minute drive to downtown Burlington. Mooring rights and Private boat launch. Private beach access to enjoy many summer activities. Private community only steps away to the Colchester/Burlington bike path. Take the bike ferry at the end of the causeway and explore Champlain Islands. * Airport Park with volleyball, tennis, and basketball courts as well as playgrounds for the younger kids. * Bayside Park with a skateboard park, playground and public beach and Paddle Sports renting paddleboards, kayaks and paddleboats right there on the beach. No laundry ( Coin-op Laundry 7 minutes away). Contact us for your Available time frames. I must go down to the lake again to the lovely lake skies and all I want is this cozy camp and watch geese go flying by. Nestled in the private Mills Point Peninsula is our intimate cottage waiting for you and your companion. Perfectly situated steps to The World Famous Colchester Causeway Bike path and cross country skiing trail, overlooking outer Malletts Bay and only minutes to Burlington. Relax on our Bluff, enjoy a book on our 3 season porch. The options are endless, your enjoyment infinite. There is now a new Laundromat, "The Starlight Laundromat" on Porters Point Road next to the Drive in theater 7 minutes from the Cottage. Had a great time. Quick response and a great experience. Thank you. Everything but linens and towels are furnished, but should you forget them they will be provided. The owner is very accommodating, pleasant, and friendly and lives nearby should any issue arise. My wife describes the cabin as darling with nice decorating touches throughout. Everything was better than expected including the space inside. Kayaks are provided as is a fire pit, chairs and Bar be que and a partial lake view. Our only disappointment was the weather which obviously was not the cabin or owners fault. We will happily return should we ever be in the area again. We recommend this cabin as it is away from the city noise and hassle and is a refreshing change from city life. Beautiful area, being right near Lake Champlain and next to the Causeway was great. Very serene location if you are looking for some peace and quiet. Great vacation for me and hubby! Nous avons bien aimé notre séjour au petit chalet. L’endroit est très tranquille et nous avons eu la visite d’un petit lièvre et d’un couple de cardinaux. C’était agréable d’entendre les oiseaux au lever du jour. Le chalet était relativement propre mais manque d’entretien. Les fenêtres sont définitivement à changer et la décoration est beaucoup trop chargée. J’ai été très surprise de constater qu’il n’y avait aucun fonds de cuisine, même pas de sel ni de poivre. Nous avons bien profité des deux kayaks, qui nous ont permis de faire une balade splendide sur le lac. Le trajet jusqu’à Burlington se fait facilement sur des routes très agréable. The greatest people on earth live on this peninsula! 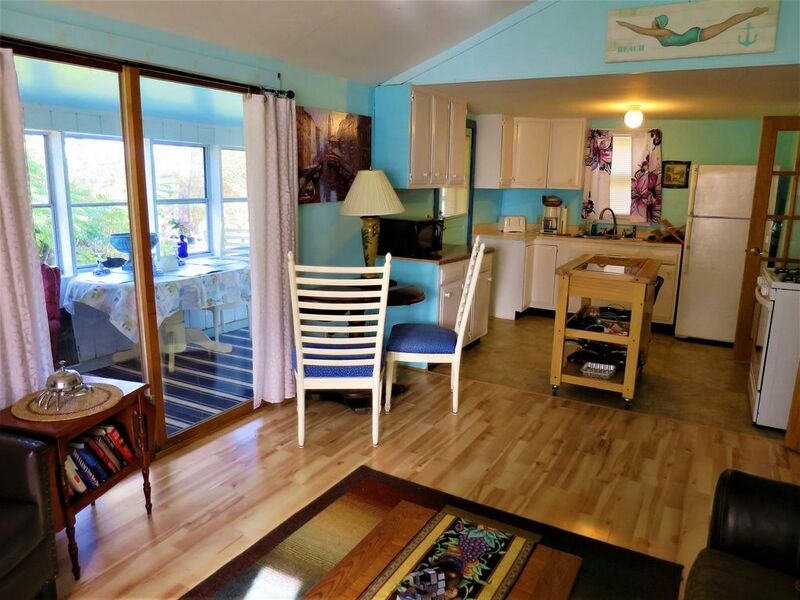 The neighborhood Located on a peninsula, this secluded cottage will free your mind. HOUSE RULES No smoking No parties or events Check in time is after 2:30 Check out by 11:am No unauthorized guests. Enjoy and be respectful of our neighbors. Parking 3 vehicles.